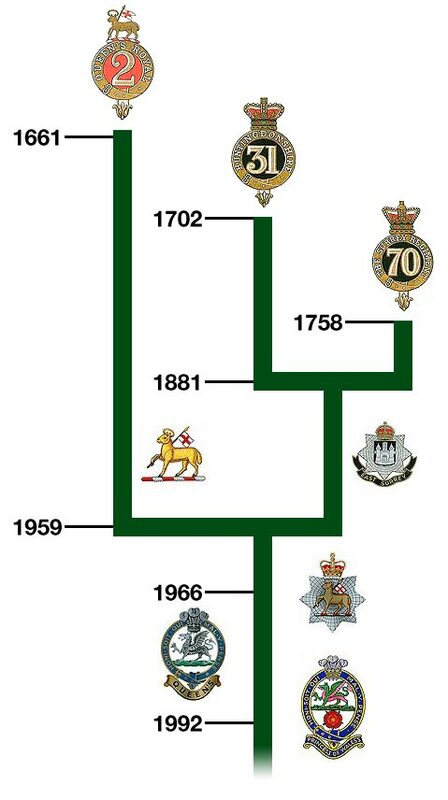 This Time Line provides a brief history of the Queen's Royal Surrey Regiment and its forebear and successor Regiments from the period leading up to its formation as the Tangier Regiment in 1661 through to the present day Princess of Wales's Royal Regiment. Brief details are given of dates, locations, organisational changes, and principal actions for all battalions, regular, militia and territorial, against the background of major national and world events. Clicking on one of the Regimental badges will access listings of significant dates for each of The Queen's Royal Regiment (2nd of Foot) from 1661 up to its amalgamation with the East Surrey Regiment in 1959, the 31st (Huntingdonshire) Regiment from 1702 up to its amalgamation with the 70th in 1881, the 70th from 1760 up to its amalgamation with the 31st in 1881 to form the East Surrey Regiment, and then for the East Surrey Regiment from 1881 up to its amalgamation with the Queen's Royal Regiment in 1959 to form the Queen's Royal Surrey Regiment. The line then continues for the Queen's Royal Surrey Regiment until 1966 when it was subsumed into the new large Queen's Regiment, then for the Queen's Regiment up to its amalgamation with the Royal Hampshire Regiment in 1992 to form the Princess of Wales's Royal Regiment, and so on to the present day.